Everyone seemed to like our last dip into Commando, so now we are having another. This Commando comes from when Commando was running credits. Ever since 1941 the much-improved MkV Spitfire has given the RAF superiority over the skies and their confidence is running high. But then the Germans unleash their new addition to the Luftwaffe fleet: the Focke-Wulf 190 (Fw 190 for short). It is soon obvious that even the much-improved Spitfires are no match for the Fw 190, and it makes short work of them. By 1942 the Fw 190 is giving the Germans the superiority in the skies. Now it is the turn of squadron commander Major Armin von Richter to feel confident and triumphant from all the shot-down Spitfires he is chalking up with his Fw 190. The British have to find a way to counter the Fw 190 threat fast. But to do that they need to capture one so they can learn all about its design, strengths, and above all, its weaknesses. They barely know anything about it from the Fw 190 debris at crash sites. So they hatch a plan for a commando mission to raid an airfield in German-occupied France, hijack an Fw 190 and bring it to Britain. Even they realise it is a crazy idea, full of difficulties and has no guarantee of success, but they approve it anyway. The pilot to fly the Fw 190 to Britain is one Tam McDermott. But first, Tam is sent to a commando camp for CO training. Tam is in for a shock when he discovers who is in charge of his CO training: Laurie Crawford. Laurie and Tam knew each other at school but never liked each other: Laurie looked down on Tam as a “swot” because he liked to read books, and pushed Tam into the school sports teams instead. Laurie was school captain, and a slave-driving fitness fanatic who showed no mercy with his team, no matter what the weather. He tolerated nothing that he regarded as shirking, especially in “Swot”. He kept driving Swot on and on until Swot was ready to collapse, and even then still keep pushing him. Laurie still has the same old contempt for “Swot”, and he makes Tam’s commando training just as gruelling and relentless. Tam is pushed until he is ready to drop and then some. But then Tam notices the training is beginning to pay off for him and he is starting to earn respect from Laurie for the first time. Then Laurie makes a sarcastic comment that he thinks the pilot will have the easiest job in the mission in flying the plane to Britain. Tam is so angry that he has Laurie drive them to an airfield full of captured aircraft – at gunpoint. Actually, Laurie is really impressed with this because he now realises CO training has turned the diminutive swot he used to deride into a whole new tough and confident man. Tam realises that Laurie is right about that. At the airfield, Tam shows Laurie just what will go into flying the Fw 190 to Britain. First, he will be flying a plane he barely knows anything about, and nobody on the Allied side has ever flown an Fw 190 before. Moreover, it is not just a matter of jumping into the cockpit and taking off. There are all the checks, fuelling, arming and so many other things that go into preparing a plane for takeoff, which they will have to allow the Germans to do for them. Plus there’s donning a flying suit, waiting for the engine to warm up, have a path cleared to taxi for takeoff, commandos to cover fire in case the Germans try to stop them…and so many other things he cuts down to bare essentials for the benefit of non-pilot Laurie. Once Laurie has a better understanding of the pilot’s point of view, he apologises to Tam. He now realises that Tam will be the one man they simply cannot afford to lose on the mission. Both men agree to forget the past and work together as friends. Laurie still calls Tam “Swot”, but now it’s a friendly nickname. The mission is set for late May and an airfield in Normandy is selected for the raid. It is going to be a double mission: a raid on a major radar installation as well as the airfield, and the former will also serve as a diversion for the latter. Tam also packs some indelible ink to mark the enemy plane as “friendly” and hopefully avoid another problem: being mistakenly shot down by his own side. A.A. Batteries on the coast have been ordered not to shoot at Fw 190s until further notice because of the mission, but there is the matter of fighter command. Unfortunately, landing in occupied territory does not go smoothly because of those huge hedges the French call blocage. One of the two Allied gliders crashes into the hedge and there are several casualties. Laurie says this is why they bring twice as many men as they need (spares!). Resistance takes care of the casualties until they can be picked up. The remaining Commandos, including Laurie and Tam, set off for the airfield. The journey makes Tam realise the benefits of his CO training and why it had to be so gruelling. Tam’s training pays off further dividends when they run into a German patrol and there is a fight, though the skirmish shows Tam the full reality of combat and kill or be killed. Further along, they see evidence that the radar mission is starting. Laurie is pleased to see it is indeed drawing the German forces from the airfield, so its security will be much reduced now. Silencers (a new invention at the time) enable them to shoot guards without raising the alarm, and help delay raising it being raised (it is a case of the later the better). They make their way to a hangar, where Tam selects Von Richter’s Fw 190 as the one to take: the Germans have it ready, and it will be the newest and best one in the squadron. They make their way in, and force the Germans to start the Fw 190 while Tam changes into a flying suit. Tam is relieved to see the controls and instruments are pretty much how the British experts have figured. The COs splash the ink on the wingtips. But there is a delay because the engine has to warm up, which loses time for the COs. Now they have to deal with a lorry and car full of newly arrived pilots. The car gets away, so Laurie knows reinforcements will now be on the way. Von Richter happened to be in that car and, using his binoculars, realises what they are trying to do. Laurie directs the COs to start blowing up the other planes. The plane is finally ready for Tam to take off. While he does so, he sees Laurie take a bullet in the arm. Moreover, an Fw 190 in another hangar is ready for immediate takeoff, so Von Richter is soon in hot pursuit of Tam, along with every other German fighter available. Tam manages to confuse the German fighters by waggling his wings to give the impression he is friendly. The fighters, having not been given the registration number of the stolen Fw 190, are fooled long enough for Tam to open fire on them. Tam encounters Spitfires too, and some also open fire until they recognise the friendly markings. Von Richter is still on Tam’s tail, and the gap is closing fast because Von Richter has far more experience than Tam in flying an Fw 190. Von Richter is getting close enough to open fire. To throw him off, Tam pulls a difficult manoeuvre called an Immelmann turn, which takes Von Richter completely by surprise. As Tam planned, this trick makes Von Richter to use up so much fuel that he has to turn back. It looks like Tam is home and dry now, with an Fw 190 for Britain. Unfortunately, although higher command told the coastal AA Batteries not to open fire on Fw 190s until the mission is concluded, they forgot to do so with the training units. So now a training unit opens fire on the Fw 190. Tam manages to eject, but the Fw 190 they worked so hard to steal for Britain is lost. Von Richter sees this, and he leaves with a parting remark to Tam that he won’t get another chance to steal an Fw 190 and their airfields will be made impregnable in future. Moreover, Tam later learns the COs were not able to retrieve Laurie and he is now MIA. A few weeks later, Von Richter and his new Fw 190 are in another dogfight. This time he is having a hard time of it. So he pulls the trick he learned from Tam: the Immelmann turn. This turns the tables for Von Richter, but it also causes him to lose his bearings. Instead of flying south to German-occupied France, he unwittingly flies north and lands in Wales. By the time he realises his mistake, he and his Fw 190 have been captured. So the British get an Fw 190 after all. Tam is dispatched to collect the Fw 190 and bring it to the airfield for captured German planes. While doing so, he takes the opportunity to actually come face to face with Von Richter. Laurie also returns. He had managed to elude capture despite his wound. The Resistance picked him up and made arrangements for him to be smuggled back to Britain. Laurie is delighted to hear that Tam has been assigned to the first squadron of the new Mark Nines. The Mark Nines have just been developed to match the Fw 190 after the British acquired Von Richter’s for comparison. The details in this story sounded so authentic and well researched that I wondered if the story itself is based on true events. So I googled, and found this was indeed the case. The characters in the story are fictional of course, but the Fw 190 was such a threat for the RAF that they actually conceived a dangerous plan to capture one by hijacking one from German-occupied France. The operation was codenamed Operation Airthief, and it was inspired by an earlier Commando operation to steal a German radar installation (which succeeded). But on the very day Operation Airthief was to be submitted for approval, it suddenly became unnecessary and was never attempted. The reason? An Fw 190 pilot really did lose his bearings after a dogfight and landed in Wales by mistake. After the Fw 190 had been analysed and dissected, the British began to overcome the threat it posed. More information can be found here. Naturally, the question “What if Operation Airthief had gone ahead?” has caught popular imagination and spawned works of fiction such as Operation Airthief by Jerry Shively. Such is the case with this Commando, though it never actually uses the name “Operation Airthief”. Having it being a nearly successful operation, only to be whipped away at the last minute, is far more effective and compelling than having the operation beat the odds and being a complete success. But even though the operation itself fails, in an ironic way it does help to capture an Fw 190 in the end, so it was not a total loss. Exciting and dangerous though the mission might be, the true power of the story comes from the incredible development of Tam McDermott, Laurie Crawford, and the relationship between them. Laurie is initially set up as the character you love to hate: a cruel slave driver and a bully as school captain, and not much nicer as captain of a CO training camp. (To be fair, CO training really was so dangerous that some people actually died on training.) But as Tam discovers, if you can earn Laurie’s respect, he’s pretty much all right. Once this is established, Laurie becomes a sympathetic character and he’s a hero, not an anti-hero. The way in which Tam earns Laurie’s respect is absolutely priceless – pulling a gun on him to get him to listen! Tam taking Laurie on a tour of the captured enemy aircraft is an extremely clever way to incorporate essential information about what will be required for piloting the hijacked plane in a manner that informs not only Laurie but the reader as well. And it’s done in a manner that is showing, not telling with dry dialogue and text boxes. It also engages and delights the reader because it is teaching that hard case Laurie a lesson into the bargain. When the actual hijack comes, the reader is already well informed about what will be required in regard to preparing the plane for the hijack and what could go wrong, so the hijack scenes are even more intense. As for Tam, he would never have expected that old bullying, slave-driving school captain to be the one to teach him confidence. But once Laurie tells him that CO training has given him a whole new confidence, Tam realises Laurie is right, and for the first time in his life he feels he can move mountains. But it’s not just the CO training that’s done it – it’s also being stung by Laurie’s remark and still feeling the old resentments towards Laurie from their school days. Putting his CO training into practice gives Tam further confidence and toughens him further as he realises the benefits of the training, and then learning to confront the brutal realities of combat – something he never quite encountered as an RAF pilot although he must have shot down his share of enemy planes. Even before the hijack, Von Richter is established as the nemesis of Tam McDermott, though the men do not know each other personally, and they do not even meet until the end of the story. For example, at the beginning of the story Von Richter leads the Fw 190 squadron against a Spitfire squadron that Tam is part of. Unlike Laurie, Von Richter is never developed as a character. He is not a cruel Nazi, but he is not portrayed as a sympathetic character either. He is a smug, arrogant enemy pilot whom we hope will get his comeuppance, which he does by becoming the disoriented Fw 190 pilot who mistakenly lands in Wales and unwittingly providing the much-needed Fw 190. Plus, it’s a really nasty twist for Von Richter that the man who comes to collect his new Fw 190 is none other than the man who stole his previous one! It’s no wonder he’s a bit upset (above) when he hears, but there is no doubt his threats of vengeance are in vain. Katie McNab and her parents are on their way to the annual get-together for Uncle Ebenezer’s birthday. It is an occasion they do not look forward to because Uncle Ebenezer is an unpleasant miserly type who is disliked by the entire family. But he is rich, and the parents hope to inherit from him, especially as their shop is doing badly. Their hopes drop when Katie arrives in a state for the party because she had to roller-skate all the way after helping out elsewhere and no buses. It looks like Ebenezer’s money will go to their snooty cousins Rodney and Caroline because of this. However, Uncle Ebenezer told them all that whoever gets his money must work for it, just as he did. And when his will is read out after he dies a few months later, they discover he meant what he said. Whichever relative reaches his home village of Yuckiemuckle first, under their own steam and starting without any money, will inherit his fortune. And so the race to Yuckiemuckle begins, between Katie and her roller skates, and Caroline and Rodney, who pull every dirty trick they can to sabotage her and get there first. And they don’t start under their own steam either – they get a lift for the first thirty miles and then cheat Katie out of a fancy dress prize when she was trying to raise money because she was not allowed to start with any. This happens every time their paths cross – they try to cheat her, but she always manages to win one way or another. Sometimes she gets her own back on them as well, such as tricking them into ‘volunteering’ for medical research, where they have to agree to catch a cold as part of the research. Katie also starts a diary of all her adventures. It has plenty to record; as well as the threat of the cheating cousins, other perils come into play along the way, including bad weather, vultures and Roman ghosts. And there are surprises, such as the legendary Loch Yuckie monster. And is it a plesiosaur? Is it a giant catfish? No, it’s a fraud the Yuckiemuckle residents perpetuate to pull in the tourists. Finally, Yuckiemuckle beckons, and the race for a fortune goes into the final hurdles for Katie and her cousins. They try to stop Katie by stealing her roller skates, but things backfire when the skates run away on Rodney. He ends up on the same bull that Katie is riding rodeo to make money. She takes back the roller skates and shares the prize money with Rodney, saying she comes from the honest side of the McNab family. But they don’t appreciate it – they are still trying to cheat her as the race goes across Loch Yuckie. Katie beats them once again with the help of the Loch Yuckie monster (she has agreed to keep its secret because the McNabs are respected in Yuckiemuckle). On the last lap, Rodney tries to outrace her on a skateboard (a foreshadowing of Concrete Surfer? ), but again things backfire and Rodney ends up in a dirty pond. Katie reaches Yuckiemuckle, beating her cousins by a margin. But Uncle Ebenezer has one last surprise for them (trust him!). After taxes and lawyers’ expenses were deducted from the fortune, all that is left of it is enough money to pay for their train fares home. It was all Uncle Ebenezer’s sense of humour and his wish that his young relations learn the meaning of hard work. Katie and her cousins are not impressed; Katie even more so when she loses the diary of her journey on the train home. However, a publisher finds the diary and finds it so amusing that he wants to publish it. 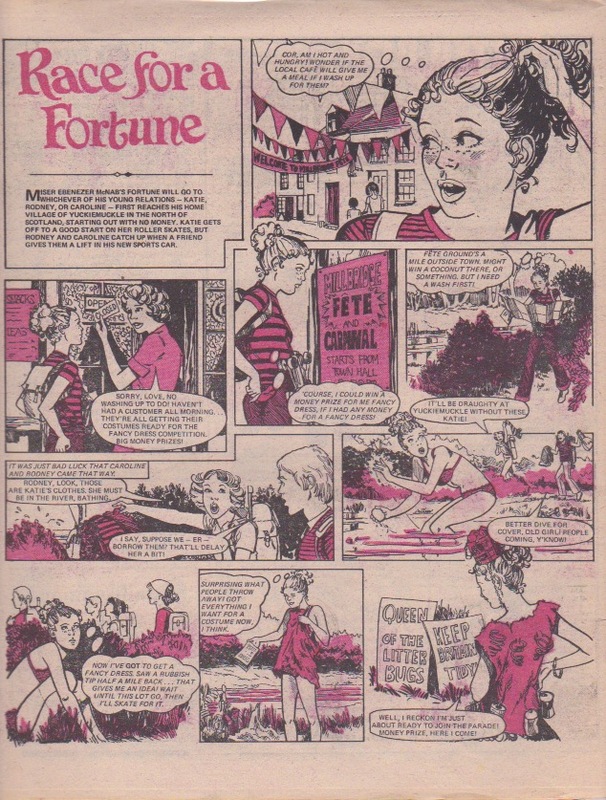 It is published as “Race for a Fortune” (presumably the part about Lake Yuckie monster was altered a bit) and Katie gets a fortune after all. Her cousins turn up for the book signings looking like they are trying to put a brave face on it, but not having much success. In girls’ comics there have been two types of ‘quest’ stories. The first is the serious one, filled with perils and life-and-death situations and deadly enemies, such as “Fran of the Floods” or “Song of the Fir Tree”. The second type of quest story is one played for light humour. Though it still has its perils, it is not life threatening or the villains as dangerous as they would be in the serious type of quest story. In fact, much of the humour can come from the villains. This is the case with Katie’s cousins, who often land themselves in sticky situations when their tricks backfire or Katie gets one up on them. Or the humour may come from the good guys, such as in Tammy’s “One Girl and Her Dog”. Most of the laughs come from the goofy dog companion who has to be taught to growl. Though goofy is not the word to describe Katie, she is still meant to have a dash of humour about her that heightens the fun of the story. For example, the gap in her front teeth gives her a slightly Alf E. Neuman look. And some of the scrapes she gets into, such as skating all the way to Ebenezer’s in her best clothes and ending up a mess when she gets there, also provide laughs. But Katie is not meant to be a klutzy character who provides loads of laughs every week, nor is she gormless or stupid. She is a very resourceful character who can survive on her wits as she makes her way to Yuckiemuckle. Humour can also come from the situations the heroine and villains can encounter on the way. For example, Katie unintentionally has fun with Roman ghosts because she doesn’t realise what they are; she thinks it’s another of her cousins’ tricks. It’s only afterwards, when she finds out her cousins weren’t around, that she finally gets a shock! Finally, you have to hand some of the laughs to Uncle Ebenezer himself. Though his miserliness is not meant to be played for laughs (such as in Judy’s “Skinflint School”), there is a dash of humour about him, such as the burr in his r’s, and his insistence that his heirs must work for his inheritance. And of course, there is his own sense of humour that gives the story a surprise ending. Or maybe not so surprising, as you might have known there would be some catch when you inherit from a man like Uncle Ebenezer. Ten school girls are to spend their holiday exploring a derelict canal on the old narrow boat. It starts with ten, but the opening blurb tells us the numbers will reduce on a trip that is to turn into a nightmare. It starts right away when Tina, who finds it ominous that the boat is called Water Witch, finds the gangplank break under her feet. She hurts her ankle and is off the trip. Gail replaces her, so the number stays at ten – for now. The other girls do not like Gail much as she is a bit pushy and does not like taking orders, but she soon blends in. And she is soon overtaking Sharon, the leader of the group, in terms of brains, courage and leadership qualities. The supernatural element is further reinforced the moment they meet the boatman’s wife who is in charge of them. She is a creepy looking gypsy like woman and her name is Mrs Bogle. How subtle. She tells them they are heading off to Creeping Weed Pool. And once they reach it, they see a warning sign that says “Beware: Lucifer Canal”. Now this is getting spookier by the minute. And it gets worse when Pickles and Jill wake up in the night to find the creeping weed all over their boat. And then it grabs Jill. She is saved from being dragged under but is scared off the trip. Down to nine. In order that their jobs are allotted fairly, Sharon has marked ten dolls with each girl’s name for the roster. But as you might have guessed, the dolls are soon marking something far more sinister. After Jill has her encounter with the weed, they find her doll smashed. The template of things to come. And others are getting rattled by the warning sign that sailing further on the canal is dangerous and getting ideas that it is haunted. And so it goes on, with one spooky thing after another, with girls getting progressively scared off and their corresponding dolls getting mysteriously smashed. The stops they make give the impression of haunting – or do they? At one point they stop at a supposed derelict inn, but find a sumptuous banquet inside and everything cosy. But when they wake up next morning, the place is derelict and cobwebby and nobody could have lived there for years. And Gail finds a question mark etched on the table. But what really scares even her off are the bats. Afterwards, Gail finds tyre tracks and a can of soup that is the same brand as the one they consumed at the inn. Coincidence or clue? At another, they encounter a ghost in a mill, but Gail finds it is just a bunch of clothes tied to a rope. From the outset, Gail has been level-headed about it all and says they are just accidents. But now she thinks someone is trying to scare them off. Gail suspects Mrs Bogle as she does seem to be trying to persuade them to leave, winding them up with stories that the canal is cursed. At one point she even tries to get the police to send them home. Gail’s suspicions are confirmed when she finds Mrs Bogle’s brooch beside yet another smashed doll. 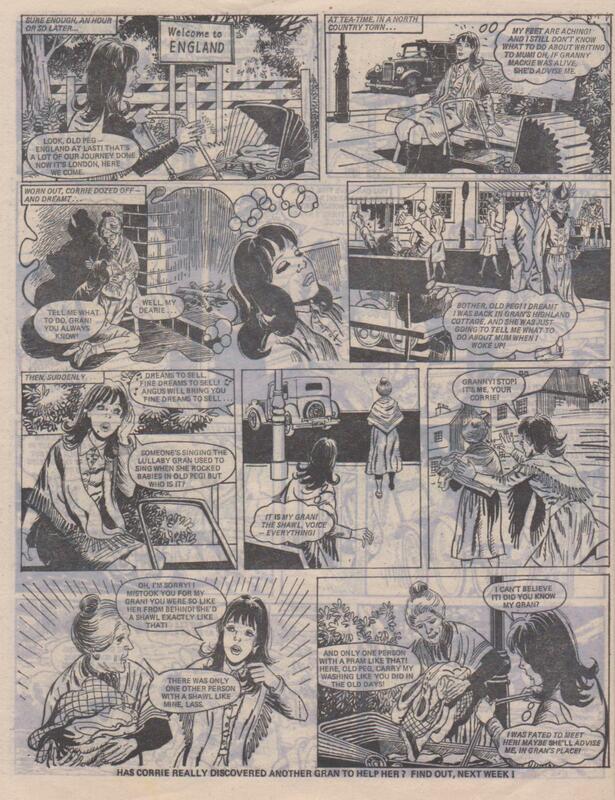 By this time the ten is down to the titular three – Gail, Pickles and Sharon. Convinced that Mrs Bogle is trying to stop them reaching the end of the canal, the girls pull a ruse to make her think she has succeeded. They pretend to turn back and put on an act of being scared off for Mrs Bogle’s benefit. She buys it and believes it is safe to tell the others it is safe to carry out the final stages of their plan. Now what can that be? Well, we know now it can’t be hauntings. The girls sneak to the end of the canal to investigate. They find an iron grille gate and – giant frogs the size of men?!? Sharon loses her nerve at this and goes back. Down to two. Pickles and Gail swim in and find a counterfeiting ring in operation. The giant frogs are men in frog suits (literally) which explains how they managed to rig things along the canal for the girls. Gail and Pickles are captured by the counterfeiters and are locked in. The counterfeiters are now ready to roll with their forgeries and proceed to make their getaway. But the girls manage to escape. Gail knew it all along because she brought their dolls so they would not get mysteriously smashed like the others. Obviously, Mrs Bogle had been breaking them to throw a scare into each girl before arranging an accident for her. They go on the trail of the counterfeiters, who find their getaway blocked by the Water Witch. In fact, they smash into it and are tipped into the water. Sharon had gone to the police, who had been hunting for the forgers for a while. The forgers fell into the trap set by the police and Sharon. They are soon rounded up, with Pickles and Gail personally catching Mrs Bogle. Now the girls turn back along the canal, revisiting the various places where they got their various scares and discuss how the counterfeiters must have rigged them. This time, though, things are more peaceful. When they are back where they started the trip, the other girls who had been scared off return to cheer the three who had stuck it out until the end. The title and opening blurb of the story make it clear what is going to happen. And when you meet Mrs Bogle (is that her real name?) you immediately share Gail’s suspicions about her. The question is, how does it all fit together? 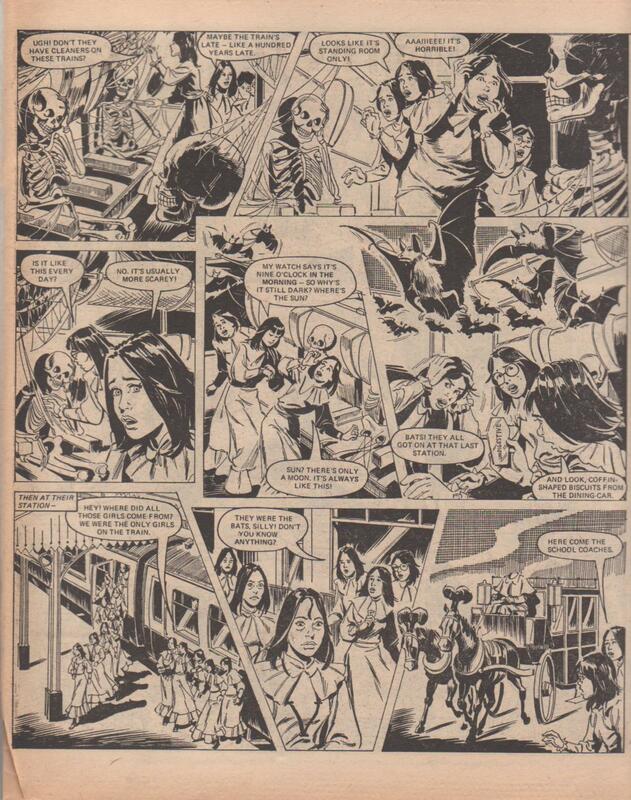 From the way the opening panel sets things up, you wonder if Mrs Bogle is going to spirit these girls away one by one or something. The girls are all winding themselves up for supernatural events. So do the people who have lived on the canal, judging by the names they have given these stops. Creeping Weed Pool? Lucifer Canal? Maybe that is why the canal is derelict. And with Mrs Bogle sharing the same theme of name, you may wonder if she is a real witch. And maybe the accidents are accidents, but why so many of them, and why does a doll smash around the same time an accident occurs? Could there really be supernatural forces closing in on them? The scares the criminals set up for the girls are brilliant, and it would not be surprising if they had pulled similar tricks on other people. The scene where they pull the weed all over the barge is extremely creepy. And the haunted inn scene would have just about anyone believing they had been in some kind of time warp to the past and come back to the present. But afterwards the criminals start making mistakes. It had to happen. And the ghost of the mill that turns out to be a rigged up dummy is where Gail is really tipped off. The crooks must have been losing their touch there. It is not surprising that their game starts to unravel after this. But until then, you can’t make out what is causing all these strange events at all. Are they unlucky coincidences, accidents and overactive imaginations? Or is there some supernatural force at work that is growing ever more dangerous the more the girls venture down the canal? It comes as a relief to discover that it is all sabotage and scares rigged by criminals. And they would have gotten away with it all if Gail had not joined the crew at the last minute. Her level-headedness, courage and quick wits, and determination to stay when others dropped out in fear is what carries the trip and the story through to the happy ending. “Then There Were 3…” may not be one of Jinty’s classics, but it is an effective, well crafted story of fear and mystery that would give readers lots of creeps and scares before the girls start to turn the tables. And we have plenty of action, adventure, and and exciting ending when Sharon, the leader who supposedly chickens out turns up trumps with the police. But it would not have ended that way if not for Gail’s determination and, more importantly, her skepticism. “Imagine the dream worlds inside your head becoming real! That’s what happened to six girls from Crawley Comprehensive after an accident with a road tanker carrying dangerous chemicals from a secret government research establishment”. Sarah (greedy): Sarah’s world is ruled by fat, greed and gluttony. The people only think about food and being as fat as they can possibly be; 20 stone is “such a trim figure”. Even the animals are fat, including the sparrows. Exercise is considered “disgusting”. The girls are emaciated by the standards of this world, even fat Sarah. So the girls are force-fed in hospital until they are so grotesquely obese that they can hardly walk. Sarah is the only one to enjoy this world because she can stuff herself with as much food as she likes and nobody calls her “fatty”. 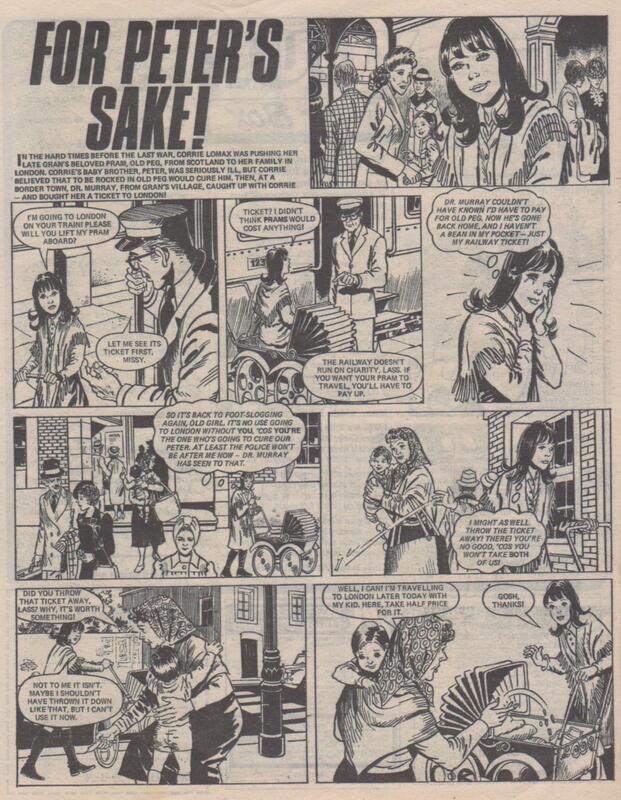 Then Sarah gets a horrible shock when sporty Ann dies from running half a mile because she is too fat. Now Sarah sees the fatty world in a whole new light. Afterwards she falls into a river and drowns because she can’t swim. Ann (sporty): Ann’s world is ruled by sport. Education, clothes, foodstuffs, food consumption, architecture, city planning, transport, politics, war, and even the death penalty are all linked to sport. In fact, everything revolves around sport and keeping fit at all costs, even if you are old and infirm. Ann simply loves her world because she can indulge in sport at every waking moment. But like the others, Ann’s indulgence becomes her undoing. It begins when the Soviet Union declares war on Britain. War is played with a sports match; the losing team is executed and the invading country just walks in if its team wins. Ann is honoured to be in the British team, but doesn’t know that the Russians are cheating by taking drugs. When Britain loses, Ann meets her downfall by the very thing she loves – sport. The method used to execute her is to be tied to an exercise bicycle until she dies from exhaustion. Samantha (vain): Samantha’s world is ruled by vanity. It is a fairy tale world and she is Sleeping Beauty – who rules this world more than her royal parents. But Samantha is no fairytale princess. She is cruel, tyrannical, power mad, and indulges in admiring her beauty at every waking moment. Her castle is known as the Castle of Mirrors because there are mirrors everywhere for Samantha to admire her beautiful face. As for the other girls, they are her downtrodden servants and threatened with torture if they displease her. Mo, whom Samantha dislikes, suffers the most in this world – partly because she refuses to be downtrodden. Then, when Samantha dumps Prince Charming for the Frog Prince, he gets revenge by hiring the witch (Mo’s mother!) who originally put Samantha to sleep. So the witch turns Samantha’s vanity against her with a spell that causes Samantha’s face to appear as a pig when reflected in the mirrors. Samantha becomes hysterical when she realises that she can never see her beautiful face again. “How can I live without admiring myself? I can’t stand it!” Samantha shrieks like a maniac, shattering all the mirrors and herself in the process. Talk about narcissism. Mo (delinquent): Mo’s world is ruled by crime, where crime, violence and anarchy are the rule. Everyone has prison numbers, and if they are stripped of them they become non-persons and fall prey to lynch mobs. Education at reform schools (which in the girls’ case is modelled on Alcatraz and patrolled by guards with live bullets in their guns) teaches crime (safe-cracking, forgery, framing, pickpocketing etc). The only crime in this world is to do a good deed, which is punishable by lynching – and nearly happens to the other girls. It seems the perfect world for the delinquent Mo to flourish – until she is kidnapped by gangsters and given a pair of concrete shoes. This has Mo anxious to turn over a new leaf if she returns to the real world before she is even thrown into the river to drown. Clare (intellectual): Clare’s world is ruled intellectualism, and the size of your IQ determines your standing in society. At the top of society are the “swots” and at the bottom are the “dullards” – a dimwitted subhuman species who are classed as animals and are treated as such (experimentation, slaughter houses, etc). The other girls are dullards because Clare always considered them stupid, “so in her world, we are stupid.” Clare is an arrogant, clinical scientist ready to perform experiments on her “dullard” classmates. But she doesn’t get the chance because dullard liberationists break them out of the laboratory and turn them loose into the wild. Clare comes after them, but she quarrels bitterly with her co-worker who wants to make a dullard wildlife film. Clare protests that this is cruel to the dullards because they cannot survive in the wild. The man retorts that she was cruel herself, for experimenting on them and what’s more, the law states that his word overrules hers because his IQ is higher than hers. Well, these were the rules Clare made for this world. Then the helicopter crashes. Clare is unhurt and is saved by her dullard friends. But she cannot survive in the wild herself; she runs away and dies in an unshown accident. Jilly (timid): Jilly’s world is ruled by fear. It is a horror-movie Goth world where everything serves only one purpose – to terrify! There is a particular emphasis on vampires, and lessons in school are geared to turn pupils into vampires, with coffin building lessons, blood pudding (with real blood) in domestic science, and first aid class includes mouth-to-neck resuscitation i.e. be bitten on the neck and be turned into one of the Undead. Clare realises that if Jilly becomes one of the Undead, she will never die – and the only way to escape this horror world is for Jilly to die. They will become trapped in this world if Jilly becomes one of the Undead and never dies, and in the penultimate episode it looks like this is going to happen. The girls do save Jilly from becoming one of the Undead, but she is a girl who is still scared of her own shadow. This too is taken to its extreme – Jilly is attacked and killed by her own shadow. The girls now wake up in hospital in the real world. They discuss their adventure and ponder over why their worlds were so horrible: “We’re not terrible people, are we?” Clare decides it was because if you take things to extremes, it gets all twisted. The girls then reflect on the lessons they have learned, including becoming more tolerant and understanding, that greed, sport, cleverness and beauty are not everything, and crime does not pay. 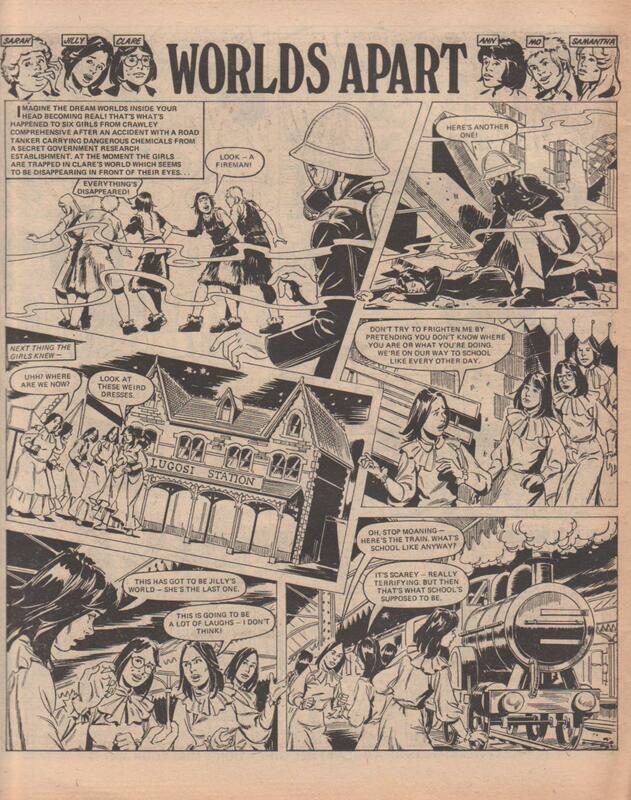 “Worlds Apart” was Jinty’s last science fiction/fantasy story before her merge with Tammy in 1981. 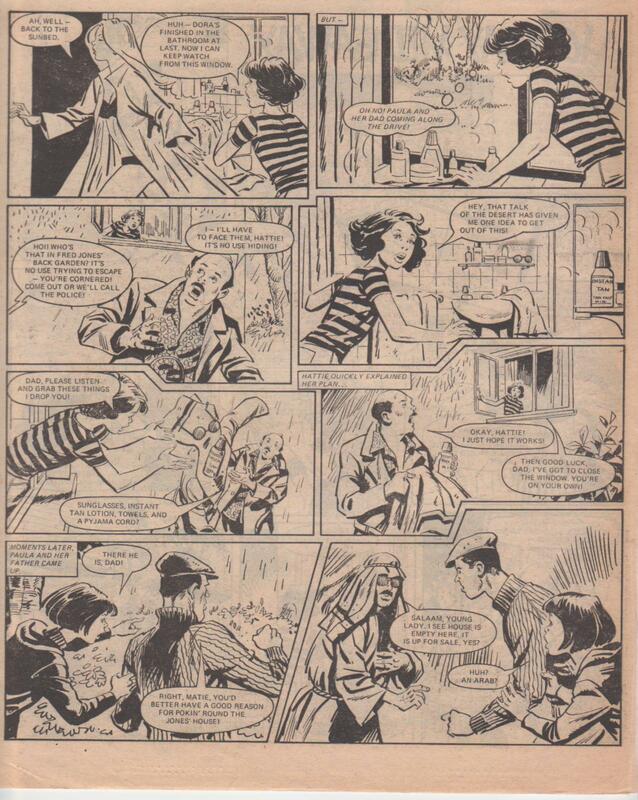 It was also the last serial that Guy Peeters drew for Jinty. 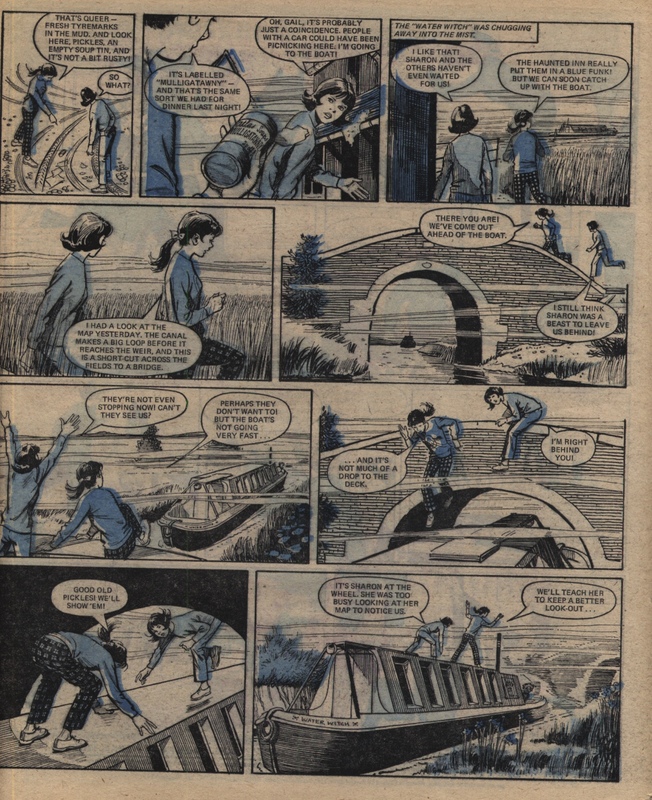 In discussions of girls’ comics this story is widely regarded as Jinty’s ultimate classic in science fiction, not to mention being an incredible adventure story, perils-and-adversity story and a sobering, thought-provoking morality story. It touches all of us because we have all had a dream world at some point and wished they could come true. But if they did, would they live up to our expectations or would they turn out to be the stuff of nightmares? Although “Worlds Apart” is considered one of the best, perhaps it could have been better. 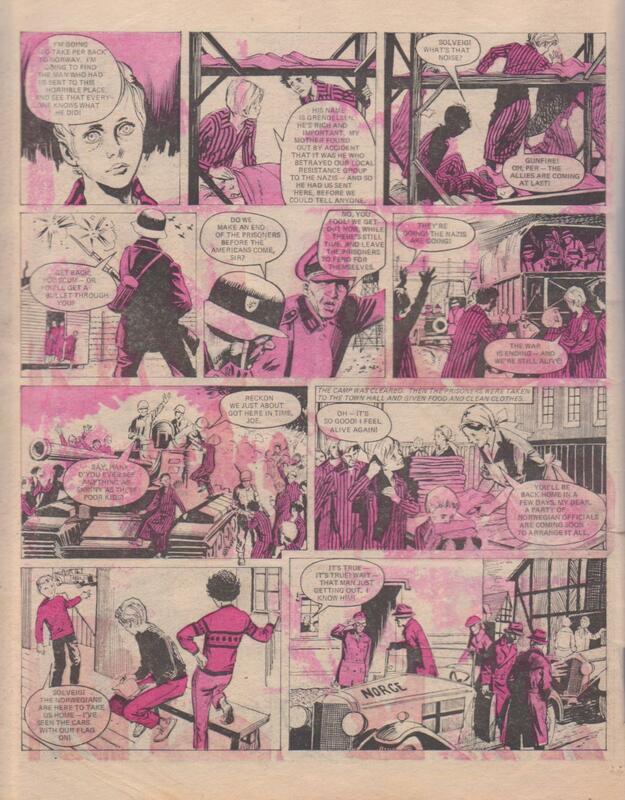 The ending suffers a bit because it looks like it was rushed to make way for the seven-issue ‘countdown’ to the merger. The last world is given short shrift (one and a half episodes while the others get four or five), so it is not as developed as much as the others and Jilly emerges as the only one not to learn anything from her world. Instead, the other girls end up feeling sorry for her for being so terrified. It feels a bit unsatisfying. All right, so maybe Jinty wanted to make a statement here that some people never learn. Or they cannot learn because they are too entrenched in what they are. 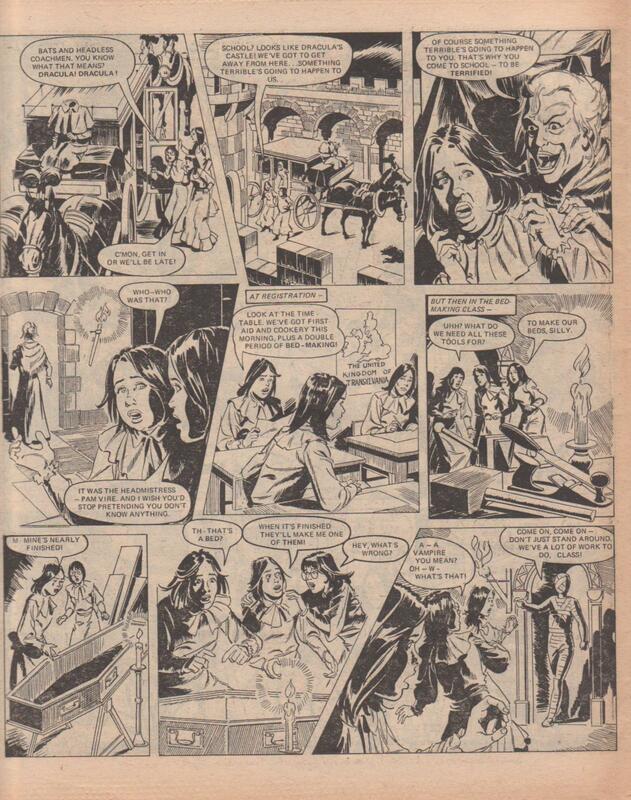 This is what some of the others begin to think about Jilly: “If this is Jilly’s mind, she must be permanently scared, poor girl!” Then again, the last two episodes were given four pages instead of the usual three. I have observed that an increase in pages and even double episodes can be a sign of pressure to finish a story quickly to clear the decks fast for something big – such as a merger. Nonetheless, “Worlds Apart” is far more hard hitting and bizarre than anything Jinty had produced before in moralism as it depicts the dangers of extremism (extremes of greed, sports-mania, vanity, crime, intellectualism and fear), and how terrible the consequences can be if extremism is allowed to carry to its logical conclusion. In fact, Clare decides that this is why the worlds were so horrible. It also took the torture of its heroines to fantastical heights of grotesqueness and perversity that remain unmatched today. For example, in the fat world the girls are force-fed until they are grotesquely fat – probably the “trim figure” of 20 stone. In the sports world they are expected to exercise while they have their school dinners, take cold showers to toughen them up, and run across the town to their dormitories because the run will help keep them fit. And in the horror world, they have classes for building their own coffins for when they are turned into vampires. Talk about digging your own grave…. There is perverse and tongue-in-cheek humour and satire too, such as where the vain world turns the fairy tale on its head. Sleeping Beauty is a tyrant instead of an innocent princess, she jilts her prince, and you find yourself sympathising with the fairy-tale witch who punishes Samantha. There are some jokes even in the horror world – the train station, for example, is called Lugosi station, and Britain is called The United Kingdom of Transylvania. And in the sports world, we learn that Hitler fought World War II via a footy match. Yes, the class is shown a slide of Hitler – “German manager and chief coach” – in his footy gear! From the outset, Solveig proves the stronger one, with spirit, strength and determination to survive and make it back home, while Per has a weaker constitution. He is more prone to illness, demoralisation and almost succumbs to the camp conditions. He needs constant buoying up physically and mentally, and he would never survive without his sister. The end of the war comes and the Allies liberate the camp. But Solveig recognises Grendelsen among the Norwegian officials who have come to collect them. Realising he has come to silence them, Solveig and Per go on the run, with Grendelsen in relentless pursuit. And Grendelsen soon proves he knows what he is doing in tracking people (and Solveig and Per never think to cover their tracks), and is very clever at tricking the authorities into helping him. And so the stage is set for a fugitive story going all the way from Germany to Norway, and all the assorted adventures, betrayals, misfortunes, lucky breaks, helpers and enemies the two children encounter along the way as they run for their lives. And all the while Solveig sings the song of the fir tree to keep her brother’s spirits up. As the story progresses, another man joins the hunt for Solveig and Per – their father, Captain Amundsen. Captain Amundsen has returned from the war, discovered his children are alive, and is trying to catch up with them. He finds out about Grendelsen’s manhunt, and Grendelsen discovers the father is also searching. So it is a three-way journey and hunt, with Grendelsen and Captain Amundsen coming close to each other as they both search for the children, with the father constantly coming tantalisingly close to his children. However, the children’s constant attempts to evade Grendelsen also mean that their father constantly misses them. Each time Captain Amundsen comes close, he finds they have just taken off because of Grendelsen or whatever, which is heartbreaking and frustrating for the poor father and the reader. His biggest heartbreak comes when it looks like Grendelsen has finally killed the children by setting them adrift in a derelict boat and left it to sink. He does not know the children were rescued in the nick of time. He heads home for Norway, vowing to make Grendelsen pay. Along the way, the children also become entwined in the fates of the sadistic Sergeant Strang and their fellow inmate Rachel Brodsky, the two concentration camp characters introduced in the first episode (above). The first occurs when the children go on a path that a local warns leads to a bad place rumoured to be haunted – haunted by Holocaust victims apparently, because the bad place turns out to be an abandoned concentration camp. The children take shelter in it anyway, not realising that Strang is doing the same thing. We see that Strang has fallen a long way down from the hulky bullying Nazi with the whip and vicious dog. Forced into hiding from the Allies, he is now living rough, ragged and scared. Also, his mental state has deteriorated, exposing the coward he really is – or maybe a guilty conscience, as Grendelsen suspects? Strang even believes the voices he hears (Solveig and Per) are the ghosts of the people who died in the camp. It gets even worse for Strang when Grendelsen shows up (he would) and gets Strang to help him. Strang ends up breaking his leg and Grendelsen abandons him: “Then that’s your hard luck!” Fortunately for Strang, a more decent man is about – Captain Amundsen, who gets help for him. So Strang is not left to die a slow, painful death, but his final fate afterwards is not revealed. The story turns back to Captain Amundsen, whose quest to catch up with his children and Grendelsen has failed yet again. The second occurs towards the end of the story. The children bump into Rachel, who is trying to get to Palestine. But she is doing it illegally with the help of an underground group because Palestine will not take any more immigrants (the strongest inference to the Jewish victims of the Holocaust in this story). Grendelsen stumbles across them and holds all three at gunpoint – something he has been doing several times already, but the children always escape with the help of a rescuer. And this is no exception; the smugglers arrive and rescue the children. Rachel is soon on her way to Palestine, but Grendelsen has the authorities arrest Per and Solveig for helping illegal immigrants. However, the children escape once more with connivance from a sympathetic soldier (the only one who shows any good sense in this story – for the most part, authority figures think Grendelsen is the one to believe). Of course it all comes to a head when the paths of all three parties finally meet. It happens at a port, where Solveig and Per try to catch a boat to Norway. Grendelsen arrives with the idea of stealing a boat, corners the children and holds them at gunpoint – again. He does the same with Captain Amundsen, who has (by fluke) arrived at the same spot. But then a bolt of lightning sends a tree toppling over Grendelsen, which kills him. And the tree is…a fir tree. Yep. After that it’s a happy reunion and return to their home with the big fir tree. For some reason World War II stories were very rare in Jinty. 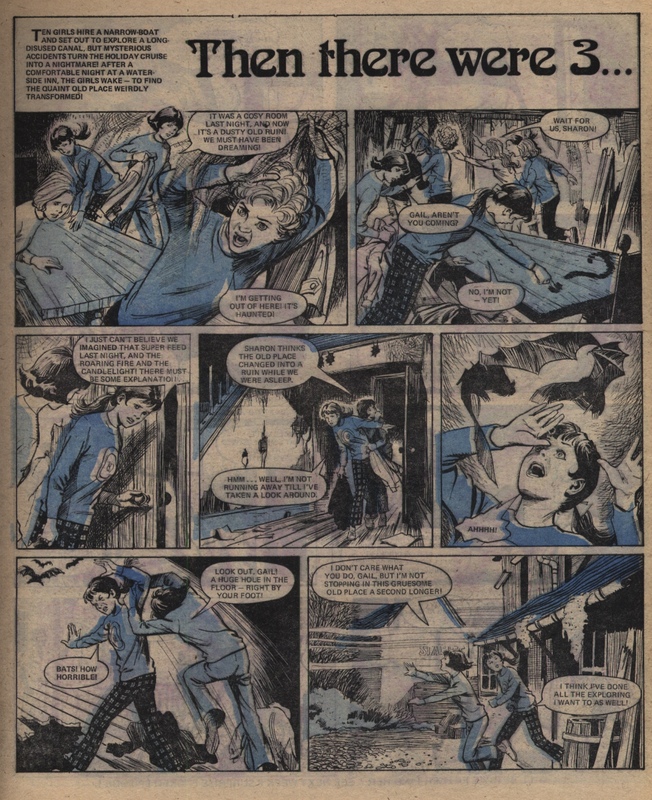 The only other Jinty serials with this theme were “Somewhere over the Rainbow” (1978) and “Daddy’s Darling” (1975), which were also drawn by Phil Townsend. 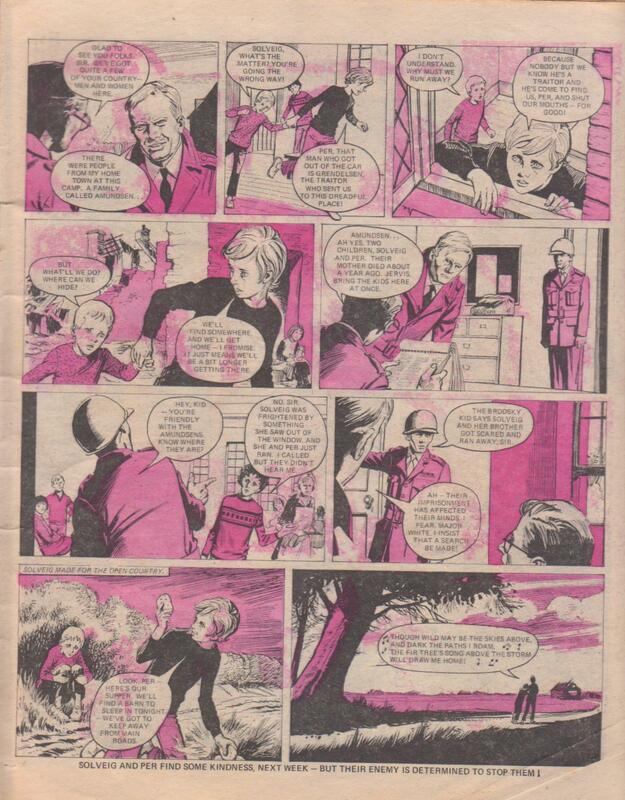 Perhaps Jinty’s emphasis on science fiction, fantasy and sport became so strong that other themes fell by the wayside? 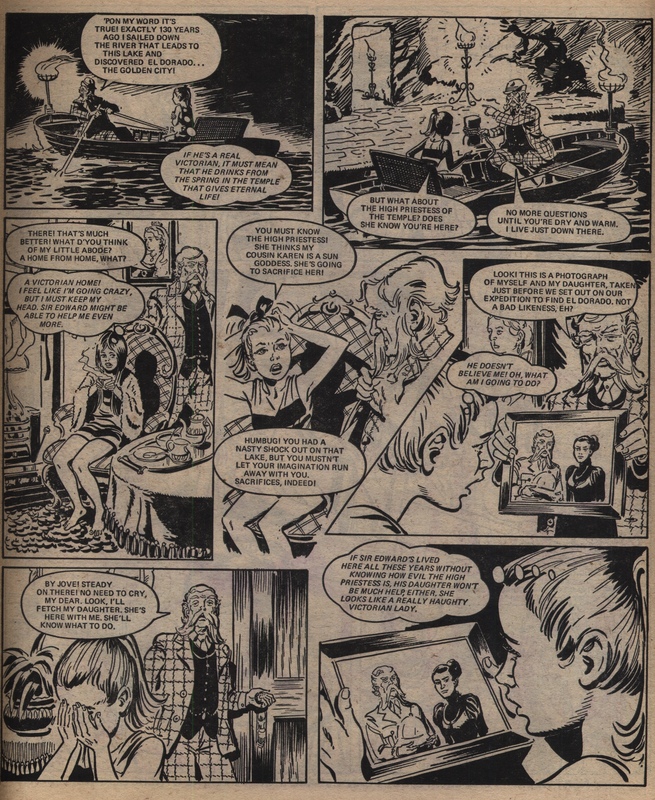 It is noteworthy that “Daddy’s Darling” also appeared in 1975, at the time when Jinty was still following Tammy’s lead in producing serials that focused on darkness, cruelty, hardship and raw emotion to tug at your heartstrings. And this is what the story clearly sets out to do. The cover says: “They must escape – or die! A story to tug at your heart.” And it must have done, because this serial ran for five months! 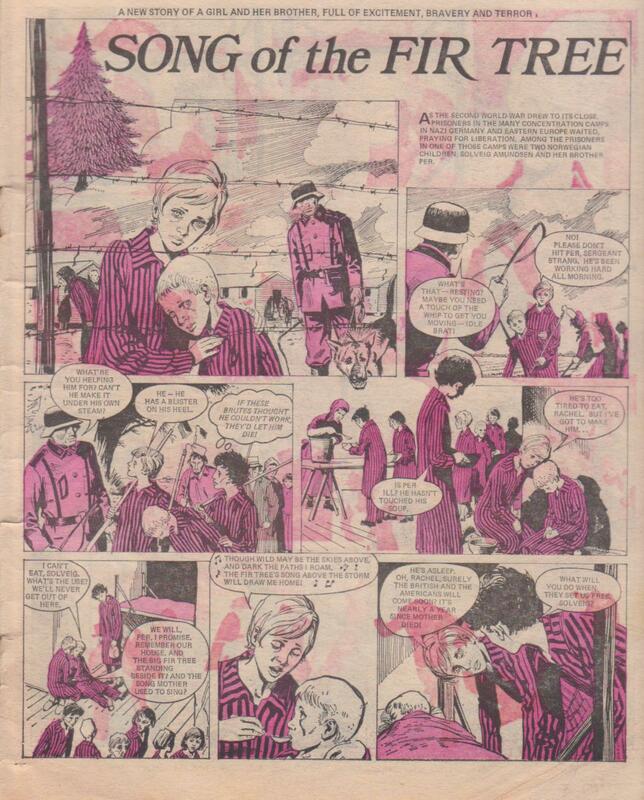 “Song of the Fir Tree” had a mix of the usual three-page spreads and two page spreads throughout its run. This is very unusual. 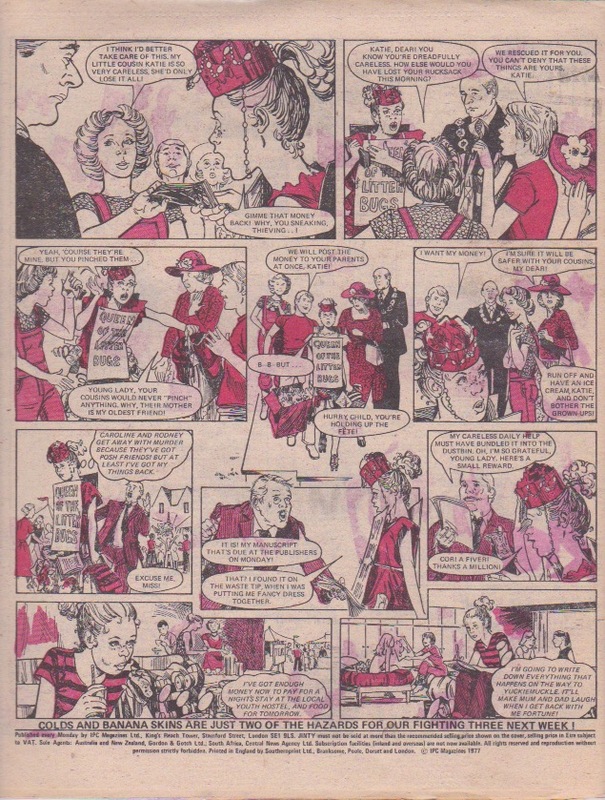 Occasionally an episode was reduced to two pages if space demanded it, or increased to four or even six if there was pressure to finish it quickly. Sometimes a story was reduced from three pages to two, as was the case in “The Secret of Trebaran” from Tammy. But what could be the reason for the mix of two and three page spreads for this story? Was the writer under pressure from the editor to condense some episodes into two pages for space reasons? Or did the writer sometimes come up with ideas that only required two pages? But on to the story itself. “Song of the Fir Tree” certainly catches your attention for featuring the Holocaust – a subject usually delicately avoided or addressed fleetingly when girls’ comics ran World War II stories. 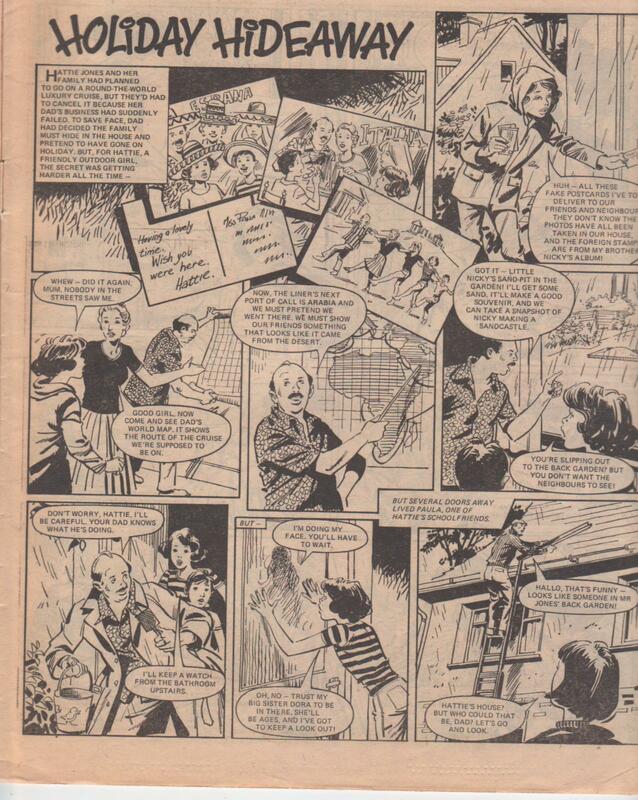 Any use of Nazi prison camps tended to focus more on captured civilians or soldiers being used as slave labour, such as in “Wendy at War” from Debbie. But here you get an immediate taste of the Holocaust the moment you see the first episode. Of course you don’t get too much of a taste; once the children are liberated, the rest of the story is focused the fugitive issue once Grendelsen shows up. But as mentioned above, the concentration camp not only comes back to bite twice, but a second camp is introduced, with ironic consequences for the Nazi villains. The journey also incorporates statements about Nazi Germany and the aftermath of World War II, such as in the devastation from the war bombing seen everywhere in the story. But the focus is more on the effects of the war on the people Solveig and Per encounter during their journey. For example, Solveig and Per take refuge at a farm where young Luise is sympathetic but warns that her Aunt Johanna will not be, so they have to stay hidden from the aunt. When Aunt Johanna discovers the fugitives, Per and Solveig find themselves caught between two Germans who were on either side of Hitler. Luise’s father was anti-Nazi and paid the price for it (taken away, never to be seen again), but Luise upholds his ideals. However, Luise’s Aunt Johanna still has her Nazi Party membership card, which Luise uses to blackmail her into putting up with the runaways until they are ready to leave. This encounter makes a strong statement that not all Germans liked Hitler. There were decent Germans in World War II, and being German did not necessarily mean being Nazi. Winston Churchill understood this – he always said “Nazis” in his speeches, not “Germans”. Other good Germans are introduced too, such as the Schulmans, a kind farming couple who nurse Per back to health when he falls ill. Per wants to stay and is tired of running. But Grendelsen shows up again – yes, dear Per, as long as Grendelsen is around, you will have no peace wherever you go. Mr Schulman shows more kindness when he picks a fight with Grendelsen, who has cornered the children again. It looks like the fight ends in Grendelsen dying in a river, but the children take the hint and take off again. Just as well, because they soon discover that Grendelsen is not dead and is back to chasing them again. People who are less kind (apart from Grendelsen and Strang) seem to be fewer, but they crop up occasionally. One example is a gang of street urchins that Per and Solveig fall in with. They leave Per carrying the can over a stolen watch, but Solveig pleads with the authorities that it is because the urchins are homeless and starving after the war, and the authorities take pity on the urchins. Do we also get a sly message about environmentalism with the constant imagery of the fir tree, and its use as a symbol of hope, steadfastness and, ultimately, retribution and salvation? There is even a hint of prophecy, as the fir tree song speaks of “wild skies” and “storm” – and in the final episode, a storm does break out and sends the fir tree toppling over Grendelsen. Indeed, “Song of the Fir Tree” ran about at the same time as Jinty’s best-remembered story about ecology, “Fran of the Floods”, where warmer temperatures cause world-wide flooding. So it is possible that they slipped an environmental message in here too. Or maybe somebody on the Jinty team had a fondness for fir trees and wanted to a story that incorporated them? Whatever the inspiration for the fir tree, you will emerge with a whole new respect for trees – especially fir trees – after reading this story. Some stories were run on the flimsiest of plots and utterly ludicrous premises. They could either have you laughing out loud and throw the comic at the wall, or have you laughing but you follow the story anyway because you do like it, in an odd, engaging sort of way. Such could well be the case with Holiday Hideway, where Mr Jones hides himself and his family in the house and pretend they all are on holiday – all because he does not want everyone to know that they cannot afford the real thing because his business has suddenly failed. Yes, hide the entire family in the house, living on tinned food, suffer emotional and psychological stress from being constantly stuck inside in hiding, and still keep up the deception of the holiday with fake holiday shots, postcards and such – all for the entire duration of a supposed luxury cruise over the entire summer holiday. And all just to save Mr Jones’ pride. Now how on earth can you pull that off? Most of it is due to Hattie, the daughter. She alone does not like the deception and thinks her parents are being silly. She does not like being stuck inside all the time either as she is an extroverted outdoor type who wants to be with her friends. But she goes along with it out of loyalty to her family. And it is thanks to Hattie’s quick wits and gymnastics skills that the secret stays safe during the inevitable sticky moments where they are in danger of being found out. Without Hattie, the Joneses would quickly have been found out, as her brother Nicky is too young, her sister Dora is too indulgent and does nothing but sit under the sunlamp, and the parents do need serious help to keep it all up. We see Hattie putting on camouflage gear, turning Red Indian, and even have her family pretend the house is haunted (when they are being burgled) and other amusing and thrilling tactics to keep the secret safe. This is perhaps why the story can be so engaging even though its premise seems extremely…improbable? Or perhaps we are just following it to see how Mr Jones gets what is coming to him. He is being dishonest, after all. And of course Mr Jones gets it in the end. When the Joneses “come home” and their friends come for the welcome home reception, the parents are all bragging about their “holiday” while Hattie, who has never approved of the charade, is ashamed at all the lies they are telling. Then along comes the paper to say their ship has been in dry dock the whole time! Well, you are never allowed to get away with deceit in girls’ comics. But you might be forgiven if you redeem yourself, which is precisely what happens next. Sudden flash flooding traps everyone in the house (I think I see echoes of another Jinty serial, Fran of the Floods here). The Joneses’ house alone is equipped to deal with it because of all the stockpiles from the Joneses’ fake holiday. So by the time the flooding subsides, everything is forgiven and Mr Jones is now sorry for his deception. Then they find it was all for nothing (it would be) because Mr Jones’ business is fine now. They can afford a holiday after all – oh, no, says, Hattie, it’s time to get back to work and school! They’ve had their holiday! And after this so-called holiday, Hattie is actually quite relieved to go back to school. Every girls’ comic has humour strips. Many of these centre around klutzy, bungling girls who get into scrapes of some sort or another, such as The Jinx from St Jonah’s. 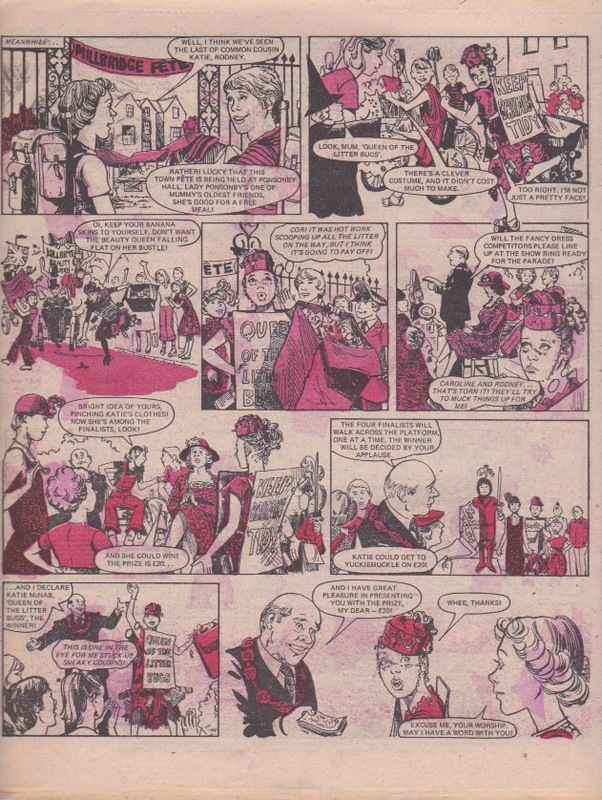 But Gertie Grit is one humour strip which is quite unique in Jinty, for it also has time travel, magic, historical periods, and an unlovely heroine with a bad temper but full of beans and character. 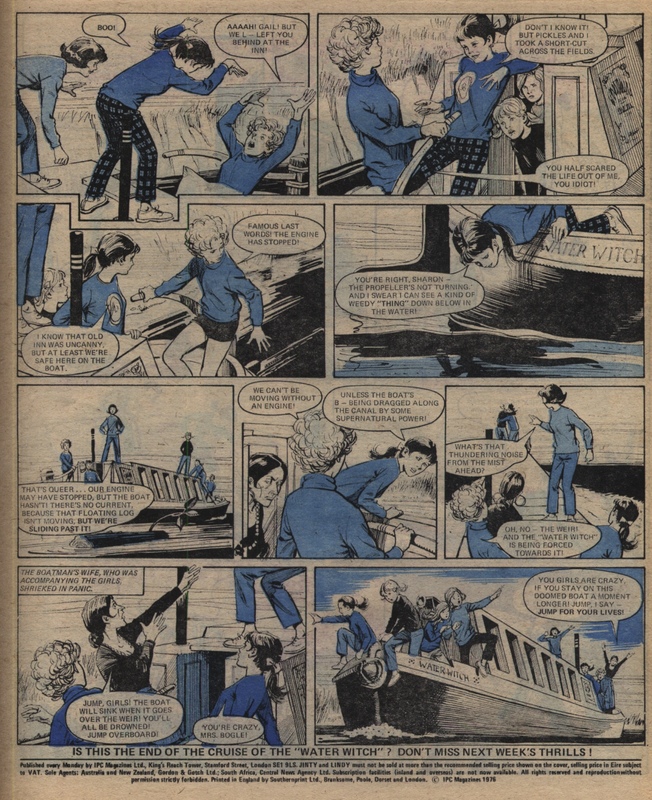 And it is drawn by an artist whose style you are far more likely to see in a funny comic, and an artist who was not on the regular Jinty team. Guest artists are always guaranteed to make a story more of a standout, for it made a refreshing break from the regular team. 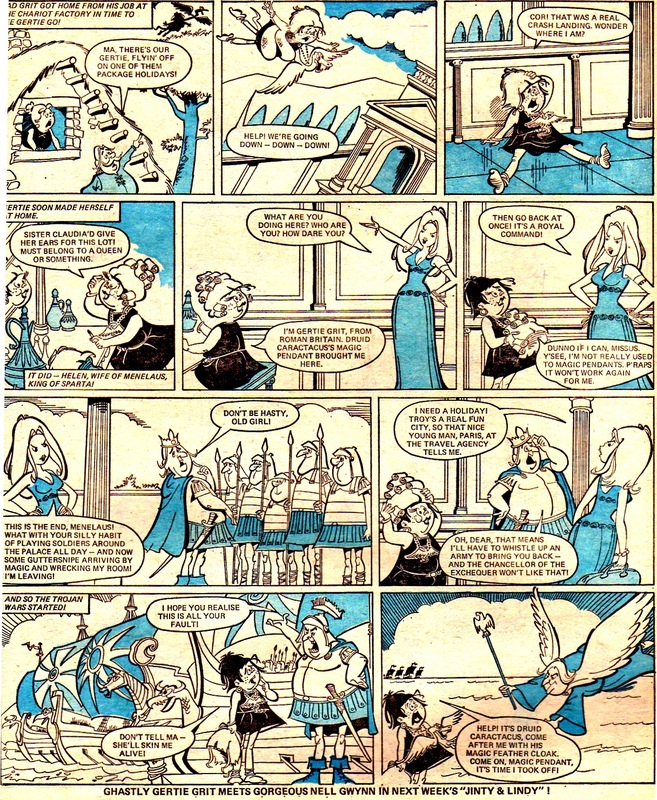 Gertie Grit hails from Brummagonia in Roman Britain, in the time of Queen Boadicea. She is a hefty, plain girl with freckles and scruffy black hair, with a bad temper and a talent for making – or getting into trouble. From the look of it, she is the black sheep of the family, to the extent of having black hair while her parents and sister are blond (this will be seen again in Jinty‘s “Black Sheep of the Bartons“). However, Gertie may have a sour, grumpy disposition but, despite the title, you cannot really find her hateful. 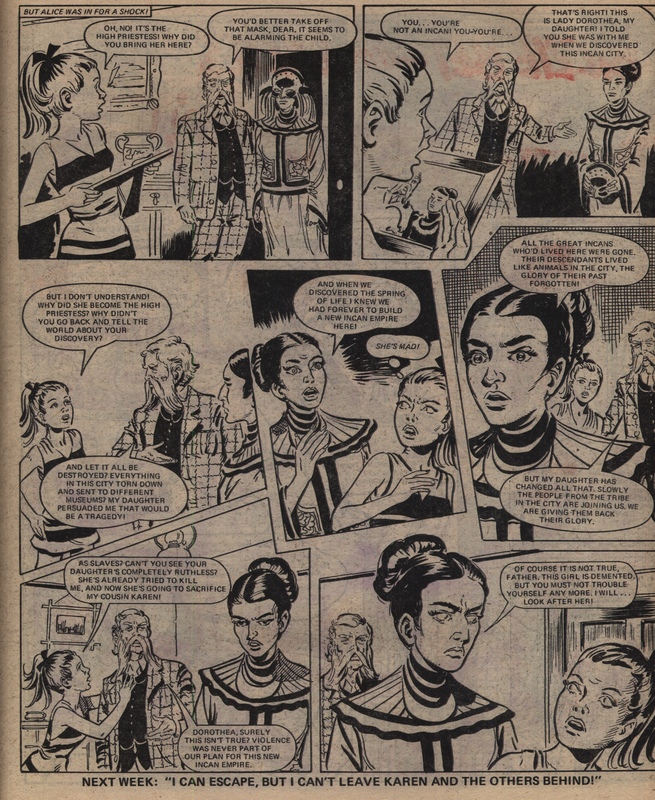 In fact, you do have to admire what a pugnacious kid she is, who knows how to put up a fight: “I don’t come from Boadicea’s tribe for nothin’!” During the course of her story, we see that Gertie is not as ghastly, gruesome or hateful as the story would have us believe. She has her good points, which she shows in the moments where she tries to be helpful or stand up to bullies. Sometimes it works out, but sometimes it doesn’t and she ends up making things worse. But on with how it all unfolds. One day Gertie steals a pendant from Druid Caractacus, but she gets more than she bargained for when she finds the pendant is a time travel device. Off she goes on time travel adventures, with a blond wig belonging to her sister Claudia in tow, and the wig becomes a running gag in many of her adventures. The pendant keeps dropping Gertie off in various time periods. With one exception, where Gertie visits a future period, these are all historical periods. And during her visit, Gertie changes the course of history through some bungling or interfering of one sort or another. For example, she unwittingly starts the Great Fire of London when using the oven at Pudding Lane to treat Claudia’s wig, but forgets to shut the oven door. At Pompeii she starts the Vesuvius eruption by using too much magic powder that a witch gave her. Her stops in history also cause the French Revolution, the Trojan War, the Battle of Hastings and an Ice Age among other time travel bungles. Sometimes Gertie’s visit comes in genuinely helpful, such as teaching the people of Stonehenge how to make wheels, or saving a dog who does not want to be launched to Mars in a space programme. Sometimes she helps by accident, such as when she is rescued from the sea by the Spanish Armada, but ends up helping the English instead, or unwittingly foils the Gunpowder Plot. Indeed, there are moments when Gertie gets quite cozy with her latest time period and would love to stay a while longer. But this never happens because Caractacus is always in pursuit of her to get his pendant back. And the moment he appears, Gertie makes a hasty exit to yet another time period. Well, of course you can’t get away with stealing from a druid. So you can guess how it will end – when Caractacus finally catches up with Gertie. When it comes, Gertie is actually pleased to see him because she needs rescue from another jam – Stone Age people want to sacrifice her to their gods (pity the poor gods!). On the way back home, Caractacus and Gertie hit a time warp which de-ages them by ten years. By the time they arrive, Caractacus’s hair has regained its youthful colour while Gertie is now a baby. Caractacus gives Gertie back to her parents, and Claudia is delighted to have her wig back. Caractacus tells the parents to make a better job of bringing Gertie up. Good luck to them – even as a baby, Gertie looks horrid. 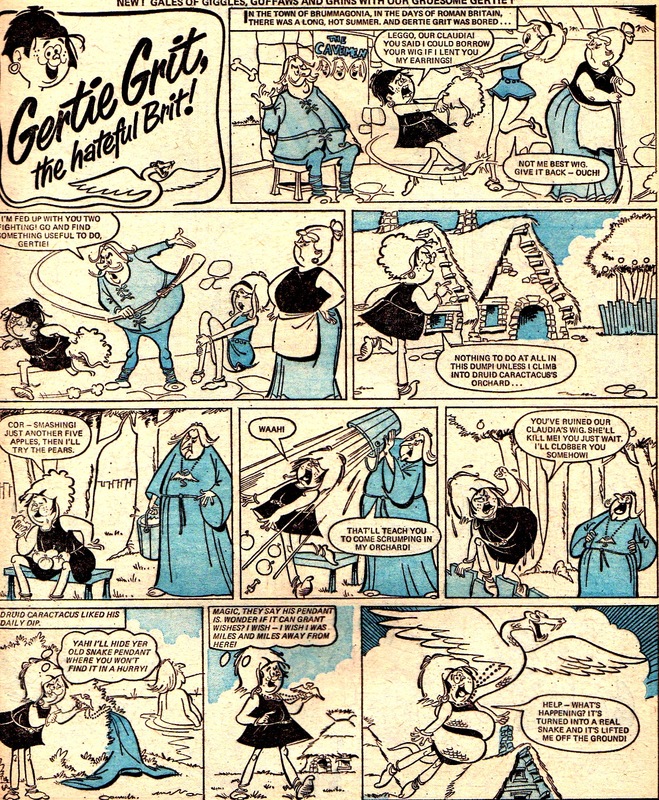 But for us readers, there were always loads of laughs out of Gertie Grit, the (however you saw her) Brit!